This recipe takes a timeless classic that’s loved by millions, then refines it to near perfection with a thick, creamy base that’s made with butter, onions, and two crowd-pleasing mushrooms. 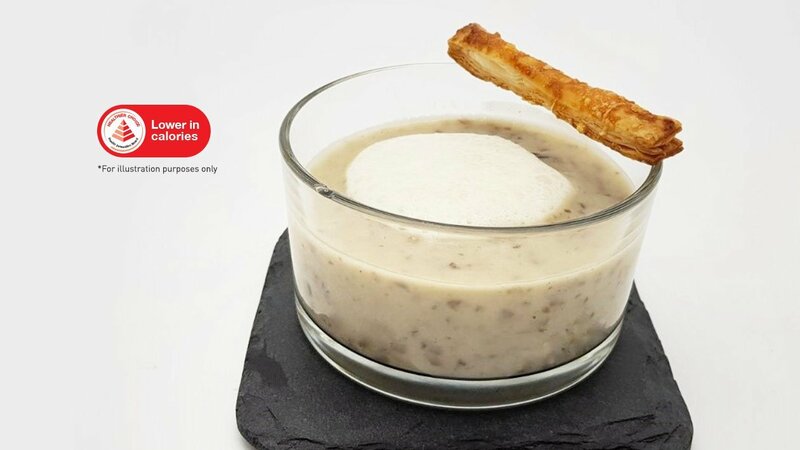 Finished with a luxurious mushroom foam that will capture the attention of your diners. Melt butter in pot, sweat onion and mushroom bits with medium heat till fragrant. In a mixing bowl, mix well 1500ml of water and knorr professional cream soup base. Set aside. Add 1125ml of water into the pot, bring to boil and let it simmer for 8mins. Add cream soup mixture into pot and bring to boil while whisking. Lastly, add in cream and portion into serving cup. In another pot, warm mushroom soup, cream and skimmed milk. Blend the mixture till foamy with a hand blender.